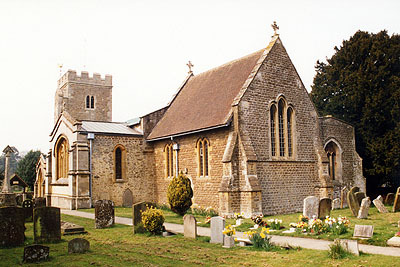 Drayton Church dates back to about 1200, notably the south chapel (although this was largely rebuilt in 1897). The north aisle is 15th century, as are most of the windows. The porch is late Victorian but reuses some fabulous medieval gargoyles, which include men fighting lions. The interior has numerous monuments to the Tyrrells and the Dews. Notice the latter's crest with the horseshoe-eating ostrich as found in medieval bestiaries. It had a medieval rood screen and three-decker Jacobean pulpit until GE Street removed the former and reduced the latter in 1855. The font is 12th century: a boring round tub, but probably the oldest item in the church. The building's great treasure is a finely carved 15th century altarpiece of Nottingham alabaster. Once so common in English churches, this is an extraordinarily rare survival of the Reformation which had been buried for safety and was only rediscovered when digging out a vault in 1814. Of six panels with a considerable amount of original colouring left, it shows the Assumption of the Virgin, the Annunciation, the Nativity, the Betrayal, the Scourging of Christ and the Entombment. Nearby are an interesting medieval aumbry (cupboard for mass vessels) with original door and some beautiful modern stained glass, to a local vicar, showing the pelican in her piety. This is NOT the official Drayton Church website. Please do NOT mail us about use of the church. Visit the C of E's Church Near You website instead.